Called “enchanting” by the Boston Globe, flutist Sarah Brady is sought after across the country as a soloist, chamber musician, and master teacher. An avid promoter of new music she has premiered and recorded new music from many of today’s top composers. Recent projects have included premieres of new solo flute and electronic music from Elena Ruehr, Andy Vores, Marti Epstein, Reinaldo Moya and John Mallia, Curtis Hughes as well as music for flute and strings from Marcos Balter, Nicholas Vines and Johnathan Bailey Holland. Her solo, chamber and over 50 orchestral recordings can be heard on the Albany, Naxos, Oxingale, Cantalope and BMOP/Sound music labels. As a leading interpreter of contemporary music, she was invited to read and record new music commissioned by Yo Yo Ma for his Silk Road Project at Tanglewood. 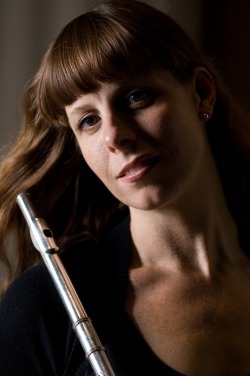 Sarah lives in Boston and performs regularly as principal flute with the Boston Modern Orchestra Project and Odyssey Opera. She can also be heard performing with the Boston Symphony Orchestra, Boston Pops, Boston Ballet, Portland Symphony Orchestra and Boston Lyric Opera. As a chamber musician she has been described as “clairvoyantly sensitive” (New Music Connoisseur), and has collaborated with the Fromm Players at Harvard, the Firebird Ensemble, the Radius Ensemble, Boston Musica Viva, The Talea Ensemble, Callithumpian Consort, Sound Icon and NotaRiotous. She is a member of the Michigan based new music ensemble Brave New Works a group that is dedicated to promoting new music throughout the US and Canada by premiering new music and educating young composers through a college residency program. The ensemble has been in residence at Cornell, Bowling Green University, the University of Michigan, Tufts University, University of Puget Sound, Williams, Western Washington University and the Boston Conservatory. In competition she was awarded second place in the National Flute Association 2006 Young Artist Competition, where she also won an award for the best performance of the newly commissioned work by Paul Drescher. She was a Semi-finalist in the Myrna Brown Competition Flute Competition, Heida Herman Woodwind Competition, Eastern Connecticut Young Artist Competition, and twice received second place in Boston’s prestigious Pappoutsakis Flute Competition. As a soloist Sarah enjoyed a sold out debut at Carnegie Hall’s Zankel Hall with pianist Oxana Yablonskaya. Currently, Sarah is the Director of the Contemporary Classical Music Department as well as Associate Professor of Flute at the Boston Conservatory at Berklee.